International Journal of Research in Health Sciences,2017,5,3,18-22. 1Professor and HOD, 2Associate Professor, 3Senior Resident, 4Assistant Professor, 5Junior Resident, Department of Respiratory Medicine, Indira Gandhi Government Medical College, Nagpur, INDIA. Introduction: India constitutes around one fifth of tuberculosis burden globally. Tuberculosis of lymph node constitutes 20-40% of extrapulmonary tuberculosis. It is difficult to determine end point of antituberculsis treatment as response is to be monitored clinically. We conducted study to monitor the response to Antitubercular Therapy (ATT) in patients with tubercular cervical lymphadenitis in our tertiary care centre. Methods: Retrospective observational study of records of 117 diagnosed cases of tubercular cervical lymphadenitis registered under DOTS at our tertiary care centre during 1st Aug 2014 to 31 Jan 2015 was done. Diagnosis was confirmed using fine needle aspiration cytology of lymph node. Results: Maximum patients were in the age group of 15-30 year (49.5%). 59% were Females & 41% were males. 32% of had associated dry cough, 11% had fever, weight loss in 13%, cough with expectoration in 4.27%. 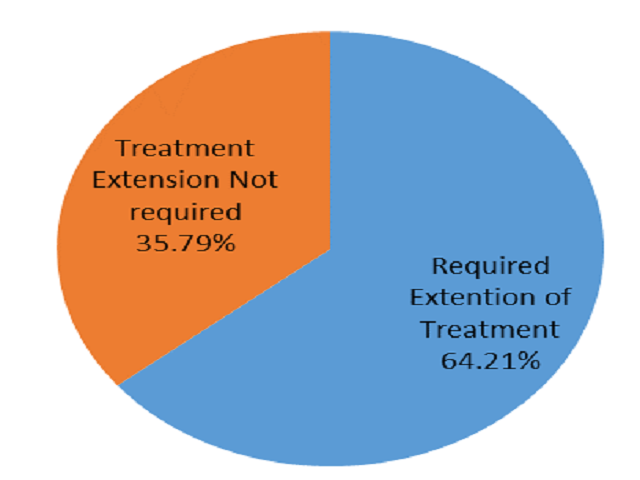 Extension of treatment was required in 64.50 % patients, while 35.50 %were cured with six months of DOTS therapy. Conclusion: We conclude that patient with TB lymphadenitis usually requires more than 6 months of treatment. HIV positivity & female gender were found to be statistically significant for extension of therapy (P=0.05 & P=0.001 respectively). Associated respiratory symptoms & LN AFB positivity were NOT found to be statistically significant for extension of therapy (P=0.58 & P=0.44 respectively). Showing more need to extend ATT in female patients .